Best Fireproof Gun Safe For The Money - Keep Your Gun Out Of Danger! Did you know that not every gun safe marketed as being fireproof is actually fireproof? Moreover, technically speaking there isn’t a gun safe in the world that is 100% fireproof. As it all depends on the amount of heat, a safe can withstand without getting damaged. Does this, therefore, mean that investing in a fireproof safe is a waste of money? Of course not, the best fireproof gun safe can keep your guns from getting damaged by fire. And not only that, but you can also store important documents inside your fireproof gun safe. With this in mind let us look at some of the gun safes that deserve to be called fireproof. 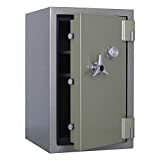 After researching extensively on the topic, we have come up with 8 best gun safes for the money. Out of the 8, there are three that we liked more than the others. But before we jump into the reviews here is a comparison chart of how the 8 faired against each other. Is a thick door best? Not all safes out there are fireproof such as some of the best gun safe under 500 we reviewed earlier are not fully fireproof. Thus, shopping for a fireproof safe will require you to invest time and money. The time is to be spent researching the characteristics of the best fireproof gun safe for the money. So what are some of the characteristics of a fireproof safe? The most common metal used in the making of gun safes is steel. However, steel comes in a variety of gauges. The most expensive and virtually impenetrable is the 8 gauge steel. Anything below this might struggle against fires. Therefore, I recommend going for a gun safe with an 8 gauge steel construction. Different companies have different methods of fire testing their safes. This means that the fire rating given by a manufacturer might not be accurate. The best way to be sure is to compare different ratings. Also, it is important to know what a safe will be up against in case of fire. On average it would take a 1,300-degrees Fahrenheit fire 60 minutes to reduce an average sized house to ash. But given that first responders are usually on scene within 10 to 15 minutes it is unlikely for this to happen. Also, most fires are quelled within 1 hour after first responders have been alerted. When you take into account all this a safe with a fire rating of 350 degrees Fahrenheit for one hour is a great choice. Additionally, stick to reputable manufacturers and retailers whose margin of error in regards to fire rating is small. The thicker the door, the harder it is to penetrate through. Ideally your gun safe should have a door that is 5/16 inches in thickness. Also, it should be made of steel pieces. The bend in the metal give it strength and increase fire protection. Guns are not the only thing you can store inside a safe. Therefore, it is also important to consider the capacity of a safe vis-à-vis your budget. A safe with more space can hold more guns and other accessories as well as important papers. So if you have a number of accessories and important papers in addition to firearms a larger safe might be ideal. However, if your gun collection is not that big, a small compact one will do just fine. Now let us look at some of the best fireproof gun safes. These are the safes that really impressed us with their features. One of our top three favorites is the Improved Steelwater standard Duty 16 Long Gun safe. Fashioned out of 14 gauge steel it can withstand temperatures of up to 1875 degrees for 1 hour. While it is not easy to ascertain this claim we found it to be very solidly built, and here are some of the things we loved. Sure this is a list of the best fireproof gun safe, but being able to offer protection from intrusion of any kind is always a priority. The combination lock on this Standard duty safe can be set from 3 to 8 digits. We found this to be more than enough to cover most people’s pin codes, also as we all know the more the digits, the harder it is to crack. This gun safe is a hard nut to crack thanks to its 10 1.5 inch chrome plated bolts. These bolts keep your guns, and other valuables secure inside. Weighing 330 pounds this gun safe offers a decent amount of interior storage space. It can hold up to 10 long guns within its interior. Also, you can use it to store other valuables as well as gun accessories. A heat-activated door seal prevents smoke and fire from entering the safe. The door seal is automatically activated when there is a fire. It will expand preventing the fire from destroying your valuables. Another one of our favorite gun safes is the heavy duty AMLD724228-blk also from Steelwater. There are several reasons why this gun safe appealed to us so much. But one of the main reasons was the fact that it has a fire rating of 1 hour. According to the manufacturer, this safe can withstand extreme temperatures for up to 1 hour. This is quite impressive given most safes can only withstand extreme temperatures for about 45 minutes. Instead of the standard 10 bolts found in other Steelwater safe this one has 20 1 ½ inch locking steel bolts. These bolts are said to be 25% longer offering added protection against unwanted intrusion. To further protect it from unwanted intrusion it comes with an E.M.P proof keypad. This keypad also has LED backlighting for easy access even in low light. There are 3 AC outlets and 2 charging ports included in the safe. This makes it easy to add a dehumidifier when you need to. This Steelwater gun safe makes it to our list due to its reliability and strength. Few guns safe’s can offer the kind of protection this one offers. It is probably the best fireproof gun safe for the money as far as reliability is concerned. And while it will cost you a considerable amount of money, its features make it worth it. The 22-MB-E ss22 gun safe from Stack-on is an inexpensive alternative to the likes of the Steelwater safes. With the capacity to hold up to 22 guns it comes with 4 shelves where you can store different accessories. But what makes it stand out is its fully convertible interior. You can use the safe to store up to 22 long guns. However, with the addition of four shelves, you can also store other accessories. Also, additional shelves can be added to give the safe more storage room. An electronic keypad is installed on the safe’s door. This keypad is a 10 digit keypad that is battery operated. You can create codes with digits between 4 and 8. Thus, you can be as creative with the digits as you wish. Since the electronic keypad is battery powered, there is always the potential of it dying out. When this happens you can use the two included backup keys. Also, the keypad has a warning light that indicates when the battery is about to go off. This might not look like the toughest gun safe out there, but its steel exterior is still above average. The steel construction and 1 inch active locking bolts makes it hard to penetrate through. This is not advertised as being a fireproof safe. However, it can hold its own when exposed to small fires. Its convertible interior is probably the best thing about it. Thanks to this interior you can convert it to suit your needs. The Extreme Duty 39 long gun protection safe is a heavy duty safe from Steelwater. What makes it stand out from the rest is its impressive fire rating. Based on its manufacturer ratings it can withstand fire for up to 120 minutes. To ensure it is pry-resistant Steelwater equipped this safe with 20 locking bolts. These locking bolts are made of solid steel. The bolts secure all four sides eliminating any vulnerability in the gun safe. This gunsafes is one of the heaviest in Steelwater’s collection and for good reasons. It is constructed from 9 gauge steel with an added ¼ solid steel plate. This gives it an extra layer of thickness. The keypad is designed to be E.M.P proof and has LED backlighting. The backlighting provides you with sufficient visibility in low light. One of the safe’s bestselling features is its fire protection. The safe can withstand external temperatures of up to 1875 degrees for up to 2 hours or 120 minutes. This makes it one of the best safes in regards to fire safety. Steelwater invested a lot in the manufacturer of this gun safe, and it is clear from its solid construction and fire rating. While it is not portable, portability is the price you have to pay for all the features you get from this gun safe. In a nutshell, there aren’t many gun safes out there that can match the quality of this Steelwater safe. Steelwater has a number of burglary gun safe in its collection, and one of our favorites is the AMSWFB-854 fireproof and burglary safe. An incredibly lightweight safe given steelwater’s standards, it offers the same quality as other steelwater safes. One of the things that make both burglar and fireproof is its solid construction. Crafted out of 12 gauge steel, it is near impossible to crack. To further bolster its near-impenetrable construction it also comes with bolt locks. True to steelwater’s reputation this safe is fireproof. It can withstand high temperatures for a period of up to 2 hours. According to the manufacturer, it can withstand temperatures of up to 1875 degrees Fahrenheit. Adding to its set of features are two adjustable and removable shelves. These shelves can be used to store a variety of accessories and documents. It offers ample space for storage of guns as well as other accessories. For installing a dehumidifier, there are three AC outlets. Also included are two USB charging ports. Weighing 410 pounds, this gun safe is considerably lighter than the other gun safe from Steelwater. Nonetheless, this is not to say it’s of low quality. With a 12 gauge steel construction, it is a tough safe that serves two purposes. It keeps your guns protected from burglars as well as from fire. Dimensions: 59"H x 28"W x 20"
One of the best fireproof gun safe for the money is the Kodiak KB19ECX gun safe. Capable of storing up to 30 long guns, it offers great value for money. Moreover, it is relatively cheaper than other similar gun safes. There are a lot of good things about this safe and one of the best things is its versatile interior. It comes complete with a rack for improved storage capacity. There are also adjustable shelves that allow you to customize the storage space. It can withstand temperatures of up to 1400 degrees Fahrenheit for 30 minutes. And uses the same door seal technology as other fireproof safes. This means in case of fire the seal starts to expand preventing the fire from damaging the interior. The seal can expand up to 7 times. In case it is tampered with or moved a spring loaded re-locker automatically kicks in place. This prevents any kind of intrusion and adds to the safe’s safety features. Unwanted intruders will have a hard time breaking it open. For purposes of installing a dehumidifier, there is a pre-drilled 3/8 inch hole. This pre-0drilled opening allows for easy installing of a dehumidifier or a swing out gun rack. There are a total of 8 door bolts with a diameter of 1 inch. These bolts ensure that it is hard to break the door. For its price, this gun safe does a good job of protecting your valuables from fire. Its anti-tamper clutch meets the Penal Code section 23655. It is, therefore, a solidly built safe that meets all the requirements set out in law. The California DOJ requirements for fire safety are the most detailed. So the fact that the Steelwater 16 long gun safe meets exceed them should excite you. Nonetheless, it is always good to look deeper at what a gun safe has to offer. Measuring 59 inches in height, it can accommodate almost any type of long gun. However, since it measures 22 inches wide, it’s not the most spacious. In total, I believe it can hold about 8 to 10 long guns, which is not bad. Two layers of fireboard line the door while all other sides of the safe have one lining of the material. The board expands and releases moisture in the event of fire. Therefore, it can protect your valuables for up to 1 hour in a fire. One area where steelwater gun safes excel is in safety features. Unlike most gun safes this one has ten locking bolts each 1 inch thick. These locking bolts help keep unwanted intruders from accessing the contents of the gun safe. To bolster its security the safe is equipped with a 4 ¾ inch thick door. This door is resistant to being pryed or being drilled. Of more importance it is virtually impossible to apply force under the door to force it open. Compared to other gun safes it is quite narrow. And while this can be a drawback for some, it is not a deal breaker. Unless you are looking to expand your gun collection, this one will be enough. Furthermore, the fact that it can withstand fire for up to 1 hour makes up for its rather narrow design. Browning is a company known for making guns and gun accessories. Thus it comes as no surprise that the Browning Droptine E-lock safe is in our list. With its 12 gauge steel construction it is tough and fire resistant for up to 30 minutes. An electronic lock acts as the main access point for the safe. This electronic lock is programmable. Meaning you can put in your own code for security. As with other fireproof gun safes, it has a fire seal that expands in the event of fire. The seal starts to expand whenever there is a fire. In total, the safe can keep your guns protected from fire for up to 30 minutes. And can withstand temperatures of up to 1400 degrees Fahrenheit. Adjustable shelves allow you to customize how you want to store your guns in the safe. On top of this, there is a door rack for storing long guns. This gives you versatility when it comes to the storage of your firearms. A re-locker system prevents any unwanted intruder from accessing the safe even when the lock is tampered with. This locking mechanic will lock itself automatically in the event of forced entry. For its price, it is a pretty standard gun safe. It offers all the features you would expect from a fireproof gun safe. Thus, while it is not without cons, it can be a great acquisition. Especially given that it is more affordable than other entries on our list. It can be said to be the best gun safe under 1000 dollars. So which is the best fireproof gun safe? This is not an easy question to answer as it all depends on your needs and budget. Each of the gun safes in our list has something to offer. As such, different gun safes will appear to different people. Nonetheless, as you have noticed many of the gun safes we have reviewed are from Steelwater. The latter company is one of the most reputed guns, safe manufacturers. As such, it would be the best place to start your search for a fireproof gun safe.